As previously mentioned on one of my Facebook status updates, I have started writing the outline of Intercession, the sequel to Sunder, and now I have started working on a general outline of the unnamed conclusion to the trilogy. All three books feature Shannan Fitzroy, who is 24 years old in both Sunder and Intercession. However, I recently decided that in the third installment, Shannan will be 35 years old, married, a mother, and in a high-ranking position (to be determined) at Warner University. Shannan at 24 is already perfectly formed in my head—what she looks like, how she reacts to stress, her general outlook on life, etc. But the events to take place in Intercession will irrevocably change her. Considering those events combined with the passing of time, I have started to construct the subtle changes in her appearance and mannerisms. As is typical for me, I have received some inspiration from television. I watched the entire Netflix series House of Cards this weekend. Of course, the main star is Kevin Spacey and he is receiving most of the press. But I was most struck by Robin Wright. 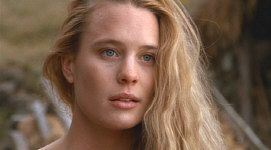 For me, as well as most other women my age, Robin Wright entered my life by way of the movie The Princess Bride. She was a beautiful 19-year-old girl with flowing hair and an innocent countenance that seemed to have been shaped by the hand of God. Fast forward 26 years, and Robin Wright is playing a hard-nosed, ambitious politician’s wife and CEO of a non-profit corporation. She is every bit as beautiful, but it is different. The way she speaks, the way she moves, the way she looks at people—it is all graceful, beautiful, and, when she wants it to be, charming. But there is not one scintilla of innocence to be found in her face, only a cool intelligence. The changes you make in the character as they age should all mean something. For Shannan, she will be thinner at 35 than she was at 24. Her hair will be shorter. There will be deep lines around her mouth and between her eyes—not one hint of chemical peels or botox. At 24 she wore long skirts and flip flops. At 35, she wears suits and stilettos, even though her colleagues have a more casual professorial style. She does not wear slacks. She does not wear flats. Ever. These details, without any other information, say something very specific about Shannan, painting a much different picture than the typical progression of post-college aging: gaining weight, adopting more casual and comfortable clothing, and taking measures to keep age from showing on the face. These kinds of details are exactly what English teachers mean when they say “show, don’t tell,” and they invite the reader into your character’s life by prompting them to examine their own. Am I like Shannan? Do I know someone who is? By the time anyone reads the third book in the series, they will have read the first and second—they will know exactly what happened to Shannan. They will wonder: would I have reacted the same way? These distant interactions with the reader are what I most love about writing. They are the reason I keep coming back for more. Yes! Something so many authors ignore is not only the physical aging of their characters, but the mental and emotional aging, and how experiences change them. My series is chronological, covering nearly 60 years, and even though many of the characters are elven, with long life spans, I have to show the changes they endure. If an author "marks time" with characters, they miss a great opportunity to really tell an important part of their characters' history and give them a depth readers can more readily identify with.